Server sprawl or data center sprawl? Is there something bigger than server sprawl, yes there is and it is called data center sprawl. Never heard about it? Read further. Looks like that for some mysterious reason everyone wants to have his own data center. Although there was an enormous growth of data centers, 93% of server capacity in those data centers is not used! Think about all those servers running the magic number of 8760 hours a year and effectively using only 613 hours a year. What an enormous waste of processing capacity and spilling of energy (not only the energy of useless running servers but also the energy to run the site infrastructure of all these data centers). Hopefully it is not only an economic rationalization statement but also an environmental/energy statement that is made. Whatever this statement will bring the discussion about cloud computing to another level and also give an enormous boost to cloud computing development, be it the private enterprise/government cloud or the “public” commercial cloud. For which players will benefit of this potential U.S government’s data center consolidation see the Datacenterknowledge blog. 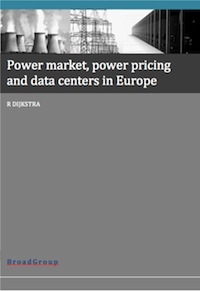 Interesting question is if the European Union will follow in this vision about shifting large numbers of governmental applications from in-house data centers to cloud computing platforms. Did you already have a look at Greening.IT ? 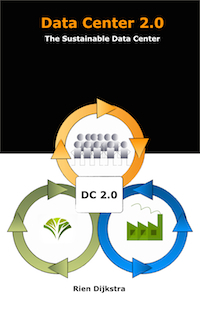 This weekend a next public draft release of our book, on how IT can be used to build a Low-Carbon Society, will be published and can be downloaded. 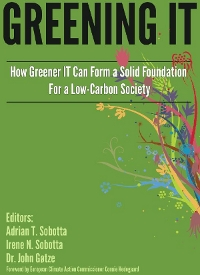 Our mission is to write an internationally collaborative non-profit book on Green IT in order to increase awareness of the possibilities of IT in building a Low Carbon Society. According to the common view, Green IT comes down to implementing technical measures. The idea is that, given better power management of equipment in the workspace (such as laptops and pc’s), more efficient power usage of servers, storage and network components, virtualization of servers, better power and cooling management in data centers, the problems can be solved. In this article, But is this really true? The reason IT is not green at this moment is at least as much due to perverse incentives. Green IT is about power and money, about raising barriers to trade, segmenting markets and differentiating products. Many of the problems can be explained more clearly and convincingly using the language of economics: asymmetric information, moral hazard, switching and transaction costs and innovation. Green IT is not a technical problem but an economical problem to be solved.